The use of Risperdal in children has sparked much debate in recent years, especially as lawsuits continue to be filed on behalf of men and young boys who claim to have developed male breasts because of the antipsychotic drug. Among other things, claims involving Risperdal, a drug manufactured by Johnson & Johnson and distributed by its subsidiary, Janssen Pharmaceuticals, allege that the companies promoted Risperdal for pediatric uses long before the U.S. Food and Drug Administration (FDA) approved it for such purposes in 2006. Plaintiffs in these cases allege side effects associated with Risperdal Gynecomastia, a condition referring to male breast development, which may be only treated with liposuction and mastectomy procedures. On a larger scale, Johnson & Johnson and Janssen agreed to pay the U.S. Department of Justice more than $2.2 billion to resolve claims that accused the companies of promoting Risperdal and several other medications for uses not approved by the FDA. The settlement was reached in November 2013, court documents indicate. Learn more about Risperdal’s alleged connection with gynecomastia, a side effect categorized by male breast growth, when you call the following information help-line: (888) 994-5118. Risperdal is an atypical antipsychotic medication approved to treat bipolar disorder and schizophrenia in adults and adolescents ages 10 to 17, as well as irritability in children with autism between the ages of 5 and 16. Symptoms associated with ADHD are also frequently treated with Risperdal, even though this is not listed as an FDA-approved use. The families of children taking Risperdal have since come forward to file lawsuits over the atypical antipsychotic, which works by targeting dopamine and serotonin receptors in the brain. Claimants similarly point to research that cites the drug’s potential to cause elevated levels of the hormone, prolactin, as a possible reason for gynecomastia. This association was first found in a 2006 study in the Journal of Clinical Pharmacology, which linked prolactin to lactation in nursing mothers and female breast development in young girls. Three years later, research published in a 2009 issue of the Journal of Child and Adolescent Psychopharmacology indicated that elevated levels of prolactin may persist up to two years. Children taking Risperdal may also be at risk for other health problems, according to research findings in June 2014. A study presented at a June 2014 meeting of the American Society of Clinical Psychopharmacology (ASCP) indicated that long-term exposure to the drug’s active ingredient, risperidone, may inhibit a child’s ability to accrue bone mass. The research looked at 94 boys aged at approximately 11.8 years, and found a significant decline in bone mass when risperidone was used for an average of 2.5 years. Plaintiffs in Risperdal lawsuits similarly point to a settlement between Johnson & Johnson and the U.S. Department of Justice. Reached in November 2013, the agreement followed a decade-long investigation into the companies’ marketing of Risperdal and several other medications. The settlement involved Johnson & Johnson’s payment of $2.5 million to resolve criminal and civil charges that involved Johnson & Johnson’s alleged promotion of Risperdal in elderly patients with dementia and children before pediatric use of the medication was FDA-approved in 2006. 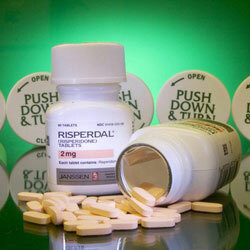 Risperdal. The U.S. National Library of Medicine, National Institutes of Health. (April 2006) Retrieved from: http://www.ncbi.nlm.nih.gov/pubmed/16633146. Risperdal. ASCP Meeting Abstract Book. (June 2014) Retrieved from: http://www.ascpmeeting.org/wp-content/uploads/2014/05/Abstract-Book-FINAL.pdf.